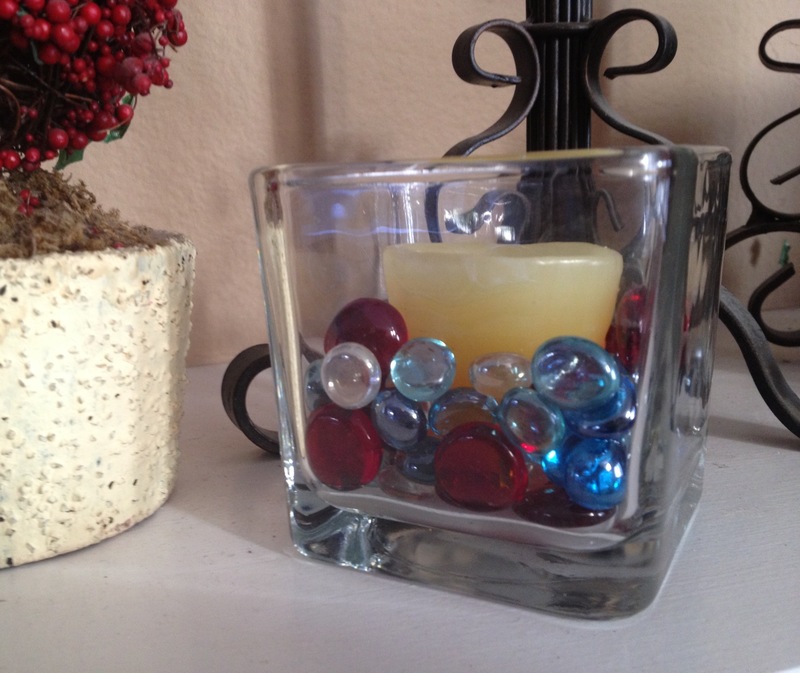 If you’ve read my blog, you know that I like to repurpose things around the house. Call me frugal, thrifty or cheap, that’s just me. Today, I want to show you how to easily decorate a serving spoon as a hostess gift or for your special table. First, you need some glass beads like the ones here on my mantel. 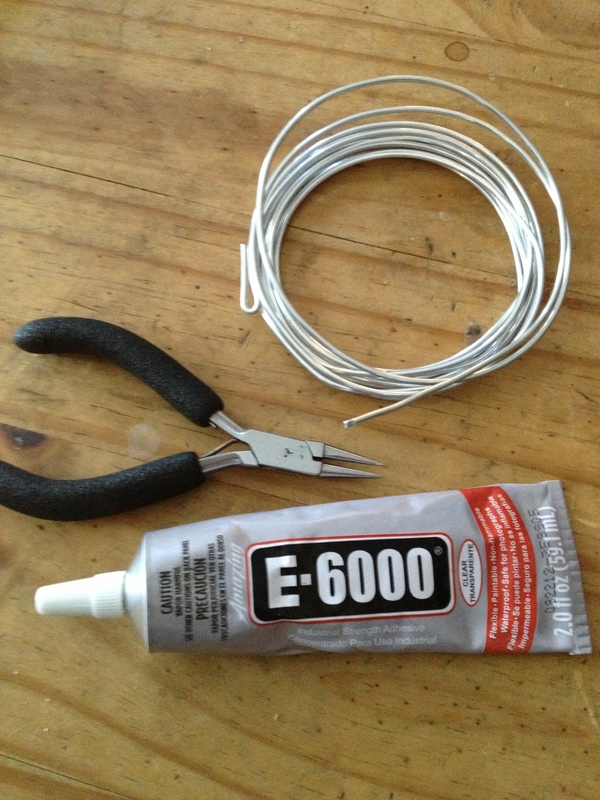 Supplies you will need: Some aluminum craft wire. This is #8 gauge. 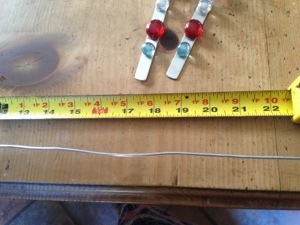 With wire, the smaller the number, the bigger the wire is. You want to use E6000 craft glue. 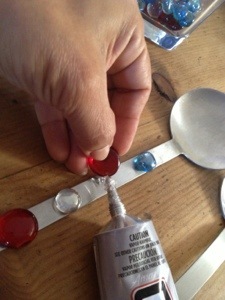 This is strongest for these beads, and they will stay in place as long as you hand wash spoon and don’t place in dishwasher. You will also need a pair of needle nose pliers. 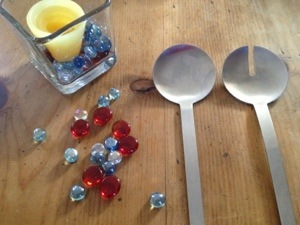 Look for some spoons to bling out, and create a pattern with your beads on the handle of spoon, leaving space in between each bead for the wire. 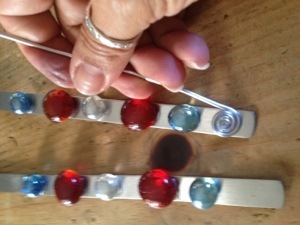 Drop some glue on bead and let them sit for at least 2 hours. You will be tempted to finish this project now, but it’s very important to give them time to dry completely. Some times I let them dry overnight. Now that your beads have completely dried, cut yourself some wire. 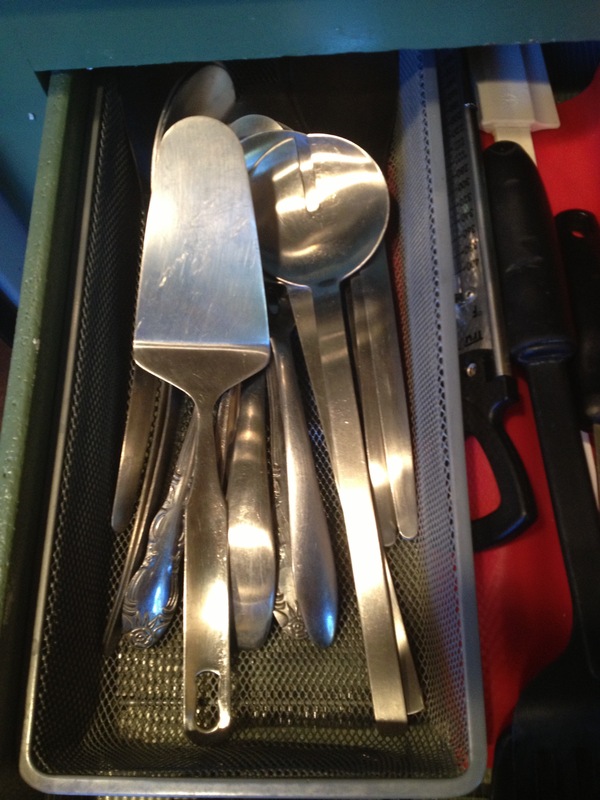 Like I’ve said before, I like using what I have around the house. and here I’ve used the line on my table. 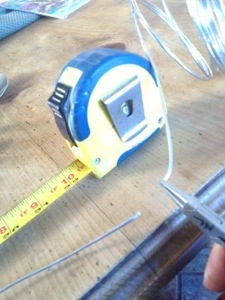 From end of table to line measures 22″, this way I don’t need to pull out the measuring tape each time, haha. 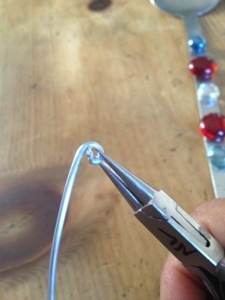 Wire is very pliable and can be bent back and forth to break, or choose to use wire cutters. With needle nose pliers, turn the end in and continue turning. 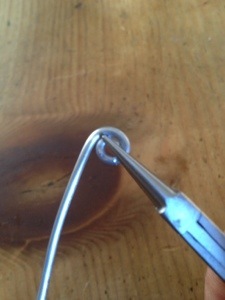 At this point, you can place the curled end center of pliers and slowly wrap the end of wire to form a spiral. You can even grasp it with your thumb and forefinger and turn into a spiral. Now place your spiral on the bottom of your spoon handle and hold your thumb on the spiral. 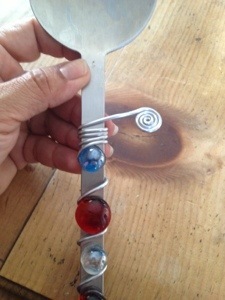 Start wrapping your wire up the spoon handle in between each bead. This is the fun part, it’s very secure and doesn’t need to be glued down. 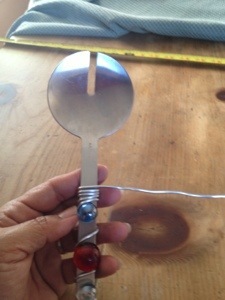 When you get to the end of the spoon, wrap 3 or 4 times around the top and finish with another spiral, wrap so the spiral ends on the front part and lay flat. 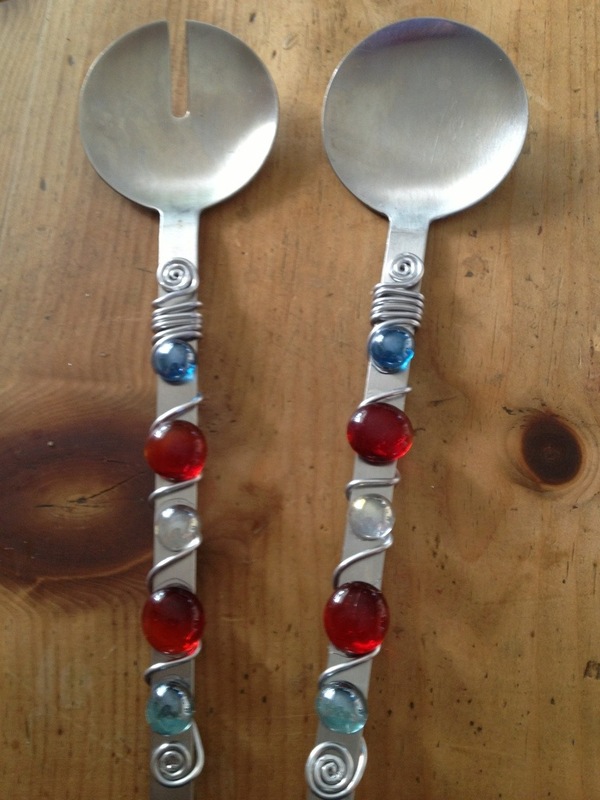 That’s it, you’ve made a beautiful beaded spoon!